What could be more natural for the human species that populates the whole surface of the Earth than to base its notion of time on the course of the Sun? If we lived in the sea, it is likely that we would have chosen to base our time on the rhythm of the tides. Today, our knowledge, our technical progress, the development of transport and globalization have led us to adopt a different and very scientific time measurement. So, the solar time of our elders is now part of our heritage. 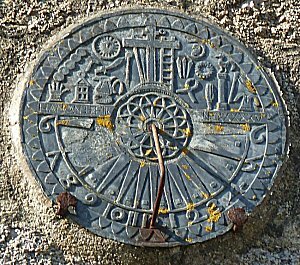 Dating from Antiquity, sundials are fixed, thus linked to a specific geographical location. The notion of time has evolved since ancient times. It was the Egyptians who first, around 1500 BC, had the idea of ​​dividing the day in 12 hours and as much for the night. 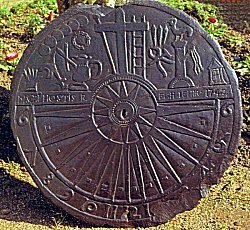 The first known sundial dates back to that time when the hours, depending on the season, were unequal. So we haven't always had the same requirement in terms of time. Today, we live by the minute and the second. Programs, shows, meetings must start on time. The craftsman bills his time. This requirement, which stems from technical inventions, only became widespread in the twentieth century. It was not the same in the past, and the old sundials bear witness to a time when more or less was tolerated because it was enough. Therfore, old dials are not perfectly accurate. The sundials depend on the sun. They do not work at night or overcast. In addition, their design requires knowledge in astronomy. 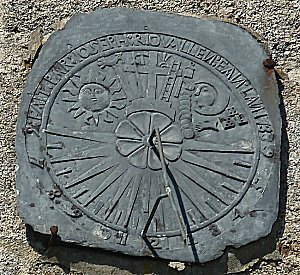 Unlike a watch or a clock, which indicates a time, the sundial measures an angle: the hour angle of the sun, which is read as if it was a time. 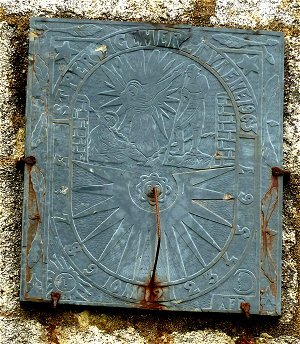 By reading it, one states the 'true solar hour' of the place where the dial is. From true solar time to legal time. Things get complicated when we want to turn this real solar time into legal time, the one that today manages our daily actions. The legal time imposed in France is, by convention, that of the Greenwich meridian increased by one hour. An extra hour is added in the summer. Since a sundial is not necessarily located on the Greenwich meridian, a correction must be made to take its geographical position into account. And it's not nothing: during a live report, one evening in August, on television, all Bretons can realize that it is already dark in Paris while it is still light behind their Windows. 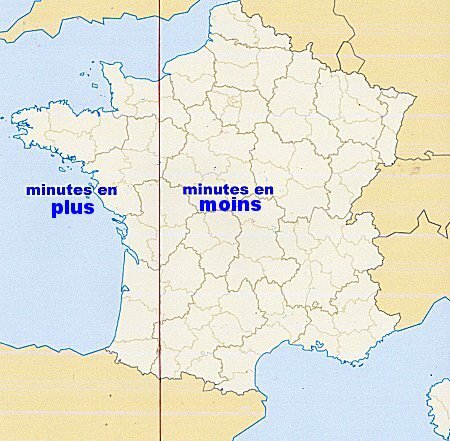 For example, solar time has 50 minutes difference between Strasburg and Brest. This is called the "longitude offset". It amounts to 4 minutes per degree of longitude: minutes less at east of the Greenwich meridian, or in addition if one is to the west, as in Brittany. So it's not very simple. and crosses the Pyrenees mountains at the Gavarnie circus. - The sun, which seems to move on the celestial equator, rather moves on the ecliptic plane. Basically, its apparent path is not round, but a little oval. In reality, it is the Earth that revolves around the Sun, but this was not known at the time of Ptolemy. - Then, it should be noted that the distance between the Earth and the Sun varies continuously throughout the year. So it is the same with the force of attraction exerted by our star. The result for our northern hemisphere is that the Earth moves faster in winter than in summer. Astronomers have added these two causes and established an equation, called the 'equation of time'. It gives in minutes and tenths of a minute the positive or negative correction to be made to the solar hour for each day of the year. "The following tables indicate the correction to be made in minutes for the 1st, 10th, 20th and 30th of the month. Here are 2 examples for LANILDUT, West longitude 4°44'45, then approximately 4.75 degrees. * On March 10 you read 11 on the sundial. + 1 h of imposed delay. + 10.5 minutes of correction from the equation of time on March 10. It will therefore be 12:30 in legal time. * On September 30 you read 13 at the sundial. minus 10 minutes of correction from the equation of time on September 30. Sundials only need a style and a flat support in a semicircle to be operational. If this support is a square or rectangular slab, it remains an important space that the dial makers often occupied. From then on, coats of arms, various maxims, pious engravings or craftsman's name illustrate this small heritage in different ways and constitute true works of art that we will always appreciate to decipher. So let us no longer pass in front of a sundial without stopping there: it is silent, but it has so much to tell us! 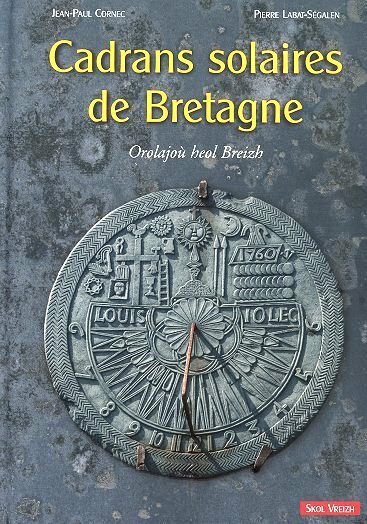 The authors of this book, passionate about gnomonics (the science of sundials), have traveled for years all the municipalities of the five historic departments of Brittany, in order to deliver in this abundantly illustrated book a complete inventory of the sundials of Brittany. The reader will find abundant explanations, much more detailed than those appearing on this page, as well as a large amount of color photographs showing the extraordinary variety offered by this little heritage still too little known to the general public. 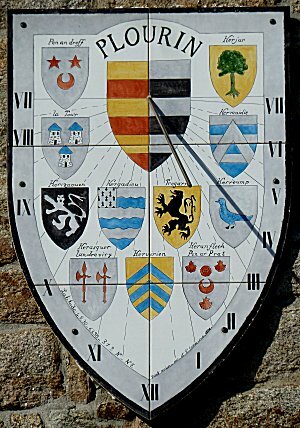 The disappeared sundial of Treouargat must still exist. Perhaps does it today decorate a house or a manor? It could also be in an attic or an antique store. Thanks to the Internet and social networks, we can find him. It is not a question of denouncing its current owner who probably does not know its origin, but to make sure that this part of the heritage of a small commune returns amicably to its former home. The details of its ornamentation allow it to be formally identified. Let us know by email (at the top of this page, information / contact button) if you think you have found it. All the inhabitants of Tréouergat will be grateful!